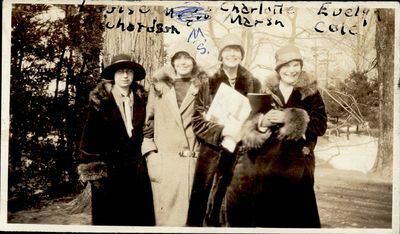 "Louise Richardson, M.S., Charlotte March, Evelyn Cole"
Louise Richardson, M.S., Charlotte March, Evelyn Cole [left to right] standing outside dressed in winter coats and hats. Charlotte and Evelyn are holding books. Trees and snow in the background. Donated by Walter E. Hurley, Sr.